In 1812, Miles Macdonell established the headquarters of the Red River Settlement nearby at Point Douglas. Named for Lord Selkirk, it was also the Hudson’s Bay Company’s first post in this area. In 1816, Cuthbert Grant’s Métis seized the fort for the Nor’Westers, whose own Fort Gibraltar had been burned by Governor Semple, but Selkirk recaptured it that summer. After the union of 1821, the Hudson’s Bay Company occupied the rebuilt Fort Gibraltar (renamed Fort Garry) and Fort Douglas remained the residence of the Governor of the settlement until it was destroyed in the flood of 1826. Named for railwayman William Methven Whyte in 1909, the site was also known as “Sir William Whyte Park” after he was knighted in 1911. Originally some two acres in size, the property was surrounded in ornamental iron fencing made by the Manitoba Anchor Wire Fence Company. Additional aesthetic improvements were made in 1910 to make a better first impression for passengers leaving the Canadian Pacific Railway Station across the street. The park was commonly but incorrectly referred to as “Dufferin Park,” causing confusion with the present Dufferin Park or its predecessor, also named Dufferin Park, at the Dufferin School site. The error arose because the retired No. 1 CPR locomotive Countess of Dufferin was once displayed here. The engine was the first steam locomotive in Western Canada, and upon being returned to Winnipeg, it was restored to its former glory and put on display. Around 1911 it was given a protective glass cover (later removed) designed by local architect John Danley Atchison. The Countess of Dufferin enjoyed a 32-year public berth in the park (September 1910 to September 1942) and is now at the Winnipeg Railway Museum. At various points in the sites past, the grounds have also hosted the Canadian Pacific Lawn Bowling Club (1925-?) and Ross House (1948-1984, since relocated to Joe Zuken Park). A surface parking lot greatly reduced the park’s area, now limited to the corner of land at Higgins Avenue and Maple Street. 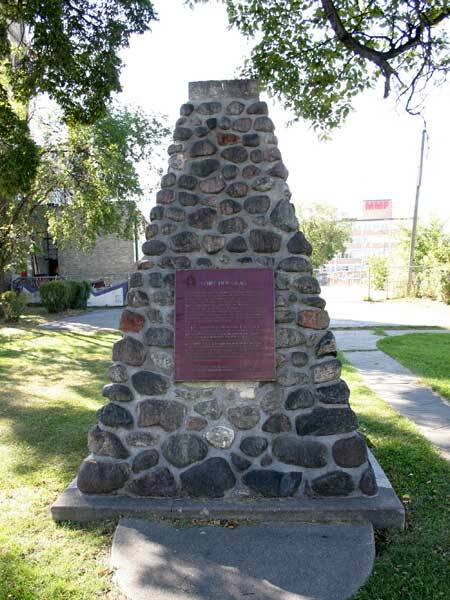 In 1925, a Historic Sites and Monuments Board of Canada cairn and plaque was unveiled in the park. “Tenders for fencing,” Winnipeg Tribune, 30 August 1909, page 2. “William Whyte Park,” Manitoba Free Press, 9 September 1909, page 16. “William Whyte Park,” Winnipeg Tribune, 1 June 1910, page 5. “Tenders for erection of building,” Manitoba Free Press, 1 September 1910, page 2. “City’s expenses well scrutinized,” Winnipeg Tribune, 23 September 1910, page 2. “Placing of old “Iron Horse” draws big crowds to William Whyte Park,” Manitoba Free Press, 13 September 1910, page 8. “Form new lawn bowling club,” Winnipeg Tribune, 25 April 1925, page 22. “Parks Commission approves cairn site,” Winnipeg Tribune, 1 June 1925, page 3. “By-law will be asked for new traffic rules,” Winnipeg Tribune, 24 June 1925, page 11. “Tablets marking historic spots to be unveiled,” Winnipeg Tribune, 29 April 1926, page 1. “Historic sites marked,” Winnipeg Tribune, 15 May 1926, page 1. “Newspaperman of early west visiting city,” Winnipeg Tribune, 14 August 1934, page 2. “Countess of Dufferin moved to new site,” Winnipeg Tribune, 9 September 1942, page 13. “Manitoba ARC Authority Inc.,” Winnipeg Free Press, 26 October 1983, page 53. [Photo caption], Winnipeg Free Press, 23 January 1984, page 3.